POLITICAL TIDBITS: Concern for GMA’s deteriorating health and demands of elementary justice move people from various strata---especially as Sandiganbayan nears decision on her petition for bail. Military high command boycotted wake for GMA’s last Chief of Staff at Camp Aguinaldo GHQ---rankling officer corps and further dividing nation. Concern for GMA’s deteriorating health and demands of elementary justice move people from various strata---especially as Sandiganbayan nears decision on her petition for bail. Military high command boycotted wake for GMA’s last Chief of Staff at Camp Aguinaldo GHQ---rankling officer corps and further dividing nation. 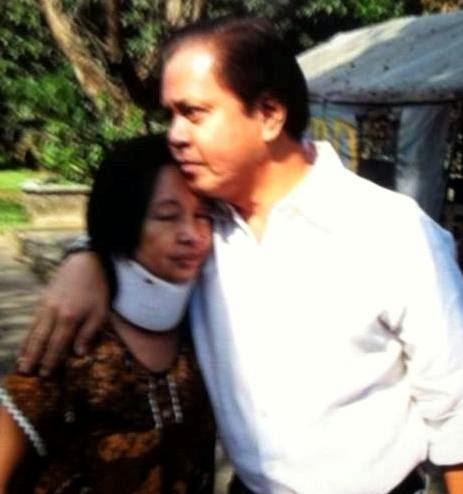 Fewer photos in recent times evoked more pathos and sympathy from the Filipino people than the one showing a very haggard and emaciated former President Macapagal Arroyo being embraced by her former Vice President Noli de Castro, as she welcomed him last week in the grounds of the Veterans Medical Memorial Center (VMMC) where she is on hospital detention. It was evident from the photo that this usually voluble TV and radio commentator was not prepared for the sight of this once super-powerful figure and how awfully thin she had become---so that he seemed to want to choke in tears. Noli followed a stream of visitors to VMMC that included Manila Mayor Joseph Estrada, retired Archbishop Oscar Cruz who was once GMA’s lead critic, former President Fidel Ramos and Bro. Eddie Villanueva. Among the senators Jinggoy Estrada and Miriam Defensor Santiago have publicly taken up her cause too and there is a clamor for CBCP President Socrates Villegas, Archbishop of Dagupan, to visit her on behalf of the bishops. It’s not only the leaders of political and religious society who are articulating concern and pity for the former President; in the social media and in various opinion pages the plea for GMA is even louder. But it’s as much pity and concern over her seriously deteriorating physical condition and her acute need for expert medical attention, as the demands of elementary justice that have moved citizens high and low for PGMA---especially now that reports indicate that the Sandiganbayan will be coming to a decision over her petition of bail. A cursory look at all four charges filed against her indicates that three have been dropped for weak evidence, and she’s now being detained in VMMC for only one case---her alleged involvement in the PCSO funds mismanagement. This case is classified by DOJ as plunder and therefore non-bailable. But as stated in an 11-page reply to the prosecution’s opposition, GMA’s lead counsel Modesto Ticman stressed to the anti-graft court’s First Division that it had erred in denying her bail---inasmuch as main witness Aleta Tolentino, PCSO chair Margarita Juico’s chief assistant, herself admitted on cross examination that prior to her appointment by President Aquino, she was never an employee or officer of the PCSO. As such, argues GMA’s lawyer, Tolentino had no personal knowledge of the PCSO’s Confidential and Intelligence Funds (CIF) transactions in 2008, 2009 and the first half of 2010, which are supposed to be at issue in this case. To this non-lawyer writer, however, among the travesties of justice in GMA’s case is the fact that it has dragged on for over two years now at such snail pace, despite her lawyers’ efforts to hasten its resolution. What has become evident by now is that the court’s intention is to make this tiny wisp of an ill woman languish in detention under the harshest physical and psychological conditions imaginable in a supposed democratic setting. These include the deprivation of her opportunity to attend daily mass at the hospital chapel (she has to request a priest from outside to say mass inside her room daily to be able to continue this lifelong practice), cutting short her walks in the hospital grounds to get some sun as well as the visitation hours of her family. Also no cell phone, no computer, forcing her to write her memoir by yellow ruled pad. To many people following GMA’s case, it seems that the intention is to break her will to live---indication of a vengeful administration. PGMA's last Chief of Staff. But there’s another case that recently occurred that strengthens this perception of the Aquino administration’s vengefulness. Last Dec. 13, 2013, the former Chief of Staff General Delfin Bangit, a member of PMA’s class ’78 and the last CS to serve GMA, died at age 58 of liver cancer at St. Luke’s Hospital. 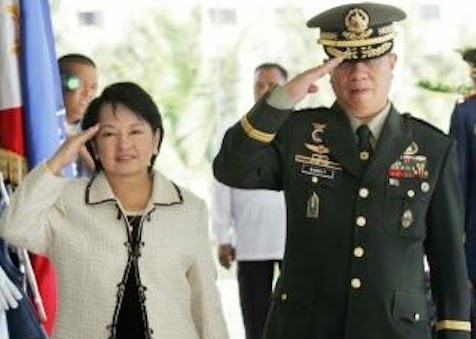 Gen. Bangit, who had previously headed the Presidential Security Group under GMA and was said to be her favorite general, had risen to sensitive positions in her administration, including the Intelligence Service of the AFP (ISAFP) and Commanding General of the Philippine Army. Gen. Bangit assumed the office of AFP Chief of Staff of GMA early in 2010, before the constitutional ban on appointments, and became the 39th CS in AFP history. He would have had about a year more before compulsory retirement when President Aquino assumed office on June 30, 2010. Reports indicated, however, that P-Noy didn’t find GMA’s last CS acceptable and asked him to vacate the post, prompting the latter to file for early retirement---the first CS ever to do so and who held the third shortest tenure in the AFP’s CS office at 104 days. Following his death last Dec. 13, Gen. Bangit’s remains were made to lie in state in the mortuary of the Libingan ng Mga Bayani in Fort Bonifacio, but there was an expected move from the officer corps to transfer him, as former CS, to the GHQ in Camp Aguinaldo for the AFP’s highest honors for a couple of days---as is its time-honored tradition. Apparently, however, there was fierce resistance from the High Command to this idea of a transfer to GHQ, owing to Gen. Bangit’s controversial standing with the President. But this refusal caused quite a stir especially among Bangit’s classmates from PMA class ’78, that the High Command was forced to relent. It allowed the transfer of his remains to GHQ BUT ONLY FOR ONE DAY. The President did not drop in at the GHQ wake, which was not surprising, but what was more significant---and highly troubling to the officer corps, especially the younger officers---was that P-Noy’s CS and the commanders of the major service commands (the Army, Air Force and Navy) failed to show up too---even as past CS of various administrations and GMA’s last Defense Chief, Norberto Gonzalez, were present at GHQ. My take on this issue is that while Gen. Bangit’s appointment as CS might have been viewed from the standpoint of the P-Noy people as controversial, still he should have been honored in death especially by the current service commanders inasmuch as he had seen a full military career. For instance, a write-up credited him for his role in the campaign vs. the Abu Sayyaf in Basilan and Sulu, where he was said to have helped neutralize sub-leaders and members of this notorious bandit group. That phase of his career, however, was disrespected in the boycott by the higher commanders of his wake.